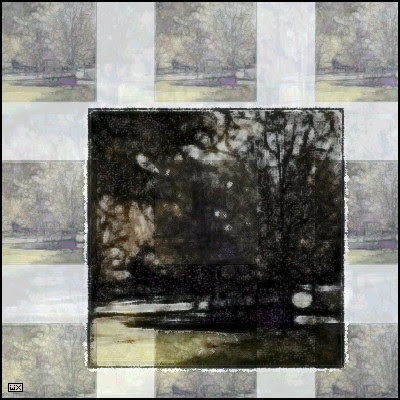 "A Walk in the Park II"
An earlier version was posted in late February of this year during a particularly miserable series of snow storms. At the time I was torn between that image and the one you see here. As is my wont, I tucked it away for a rainy day and here you have it. I clicked back to see the other one again and I think the feel of these two images are quite different. I wonder if I am influenced by the titles a bit? Either way I didn't expect to hear birds in this one (re comment on the earlier version) rather I thought I might find some wonderful twigs and bits of lichen that have fallen...Me, I'd be happy either way! I remember the snowy one, maybe I prefer this better since it's only rain, not snow. great color at bottom left of insert - looks like an organic firework burst - very elegant.